Impetus is a complicated film, one that switches between a narrative, a documentary and a film within a film. In the film, an unnamed director (if we follow the documentary line of things, it’s actual director Jennifer Alleyn herself) struggles to find inspiration to create again after the man she loves leaves her. Within the wake of this loss, we find a rich film that investigates what can come of that void. Alleyn’s journey through grief results in a fragmented story, one that quietly shudders between her introspective narration, her conversations with friends, and the film she is attempting to make. At the beginning, Alleyn muses to herself about potential subjects for the film she longs to make, just as she also wonders about her own pain. A shot of a screaming, drunken man raging through the street prompts her to muse, “His scream echoes my own.” She digs at the story of this “drifter,” quickly and impulsively. She clings to it. It’s the first idea, it seems, that she has had since the event of loss turned her world upside down. She crafts a story around the wounded drifter, about a man named Rudolph (played by Emmanuel Schwartz) who flees to New York overnight to make a job interview for a housesitting job he found in the classifieds. 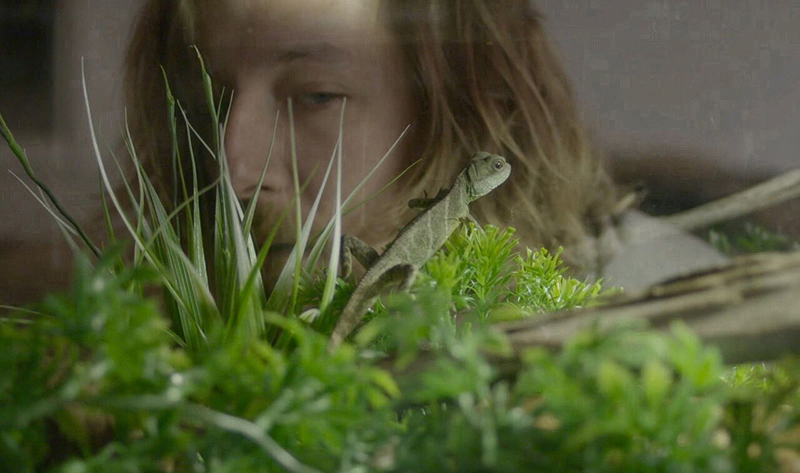 The drifter gets the job, and soon takes up the task of taking care of the apartment and its pet lizard. We see Alleyn’s actual production of this story, as well as the scenes as they’re meant to be seen as a film. We later see Alleyn lamenting to a friend about the loss of this actor, after he leaves for a bigger part in another movie and can’t finish shooting for hers. The conversations Alleyn has with her friend, an actress named Pascale who is played by the real life Pascale Bussiers reveals much about what plagues her, and what drives her. Alleyn realizes it was a mistake trying to cast a man to play a role based on her own pain. Together, she and Pascale also realize that “doubt is essential to freedom” and that “comfort makes us lazy,” and that “freedom is less comfortable than what’s familiar.” These women are older, at the dawn of their middle age, and together, they bond over what it means to lose love—as a woman—and what can be gained from embracing loss and moving on. Preceded by animated short Saw/Ate Sad Bird, directed by Lauren Flinner.